Wisdom teeth are the last teeth to erupt within the mouth. When they align properly and gum tissue is healthy, wisdom teeth do not have to be removed. Unfortunately, this does not generally happen. They may grow sideways, partially emerge from the gum, and even remain trapped beneath the gum and bone. These poorly positioned impacted teeth can cause many problems. When they are partially erupted, the opening around the teeth allows bacteria to grow and will eventually cause an infection. The result: swelling, stiffness, pain, and illness. 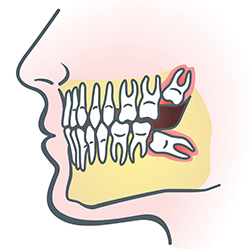 The pressure from the erupting wisdom teeth may move other teeth out of their natural alignment, resulting in a crooked smile and affected bite. The most serious problem occurs when tumors or cysts form around the impacted wisdom teeth, resulting in the destruction of the jawbone and healthy teeth. Removal of the offending impacted teeth usually resolves these problems. Early wisdom teeth removal is recommended to avoid such future problems and to decrease the surgical risk involved with the procedure. With an oral examination and x-rays of the mouth, your oral surgeon can evaluate the position of the wisdom teeth and predict if there are present or may be future problems. Studies have shown that early evaluation and treatment result in a superior outcome for the patient. Patients are generally first evaluated in the mid-teenage years by their dentist, orthodontist or by an oral and maxillofacial surgeon. In most cases, the wisdom teeth removal is performed under local anesthesia, laughing gas (nitrous oxide/oxygen analgesia) or general anesthesia. Sedation options will be discussed with you before the procedure is performed. Once the teeth are removed, the gum is sutured. To help control bleeding, bite down on the gauze placed in your mouth. You will rest under our supervision in the office until you are ready to be taken home. Upon discharge, your postoperative kit will include postoperative instructions, a prescription for pain medication, antibiotics, and a follow-up appointment in one week for suture removal. If you have any questions, please do not hesitate to call our Irvine office. An impacted tooth simply means that it is “stuck” and cannot erupt into function. The maxillary cuspid (also called the canine) is the second most common tooth to become impacted. The cuspid tooth is a critical tooth in the dental arch and plays an important role in your bite. The cuspid teeth are very strong biting teeth and have the longest roots of any human teeth. They are designed to be the first teeth that touch when your jaws close together so they guide the rest of the teeth into the proper bite. Normally, the maxillary cuspid teeth are the last of the front teeth to erupt into place, which is why they are more likely to become impacted. If a cuspid tooth gets impacted, every effort is made to guide it into proper position in the dental arch. This may involve several dental interventions. As a preventative measure, the primary cuspid, or “baby tooth” may be removed early to provide space for the adult canine to come in. Irvine dentist may also need to surgically expose the canine and guide it into alignment using orthodontics.